DrinkWire is Liquor.com’s showcase for the best articles, recipes and reviews from the web’s top writers and bloggers. In this post, offers a spam cocktail. Spam. You either love it or hate it. The canned meat staple is usually more found in food but being a lover of this tinned stuff, and being a fan of bacon fat washed (aka infused) whiskey, I just thought one day, why not combine the two? 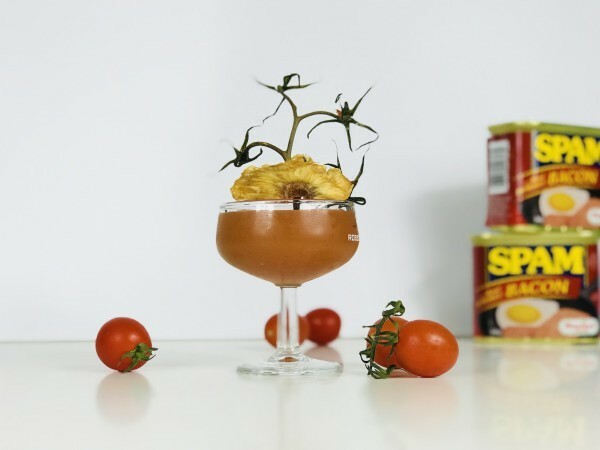 The inspiration for this particular cocktail came from a Hawaiian pizza, with its combination of pineapple and ham against a tomato sauce base. I experimented with different bases for the spam infusion but ended up choosing the Stiggins pineapple rum because the flavours seemed to work best. To make the spam fat washed rum, I firstly fried some spam and basically poured the leftover oil/fat into the rum. Let it infuse overnight in the fridge and strain against a muslin cloth the next day to take out the fat, which would have congealed by this time. Combine all ingredients in shaker with ice and shake vigorously. Strain into chilled coupe. Garnish with a dried pineapple slice.